A Photon is unique; it has both wave like and particle like properties. It is the only particle in the universe which travels at the speed of light – 186,000 miles per sec. According to science it is physically impossible for anything to travel at the speed of light, because it will require infinite amount of energy to push something to achieve the speed of light. Infinite means infinite, therefore it is just impossible to achieve the speed of light for any object. At the Large Hardon Collider in CERN, Switzerland, it has been possible to achieve 99.999% of the speed of light – achieving 100% seems impossible. To explain the implications of this theory, Einstein provided a thought experiment, as it was impossible for cars or rockets to reach speeds anywhere close to the speed of light. You are on earth and your twin brother goes into space in a rocket. You both have the top of the range atomic clocks. Your twin brother’s rocket is traveling at the speed of 0.8c. You at earth measure the speed of the light, you find it be c, your twin brother also measures the speed of light, he will also find the speed to be c. How come? The clock in the rocket slows down and his ruler in the rocket gets compressed and is much shorter so that the speed of light is still c. His spacetime framework is more compressed, but the speed of light is still c. Your twin brother returns to earth. Your clock shows he travelled for 10 years, while his clock shows he travelled for 6 years only. The photon travels only in the presence of the observer. If there is no observer, then the photon remains at a standstill. An observer is a prerequisite for the photon to travel. In our earlier discussions we have mentioned that the only observer in this universe is the Atma, which is the underlying reality of you, me and every living being. So, whenever a photon comes in the presence of Awareness in any mind – your mind, my mind or the cosmic mind, the photon becomes conscious and then and only then we are aware of the photon. It is this photon which zips around at the speed of light. The perception must take place in the mind first, only then it is possible for the photon to be observed in the physical world. It is this basic reason, why the perception process as taught by Vedanta is the only correct way to understand the phenomenon. From the photon’s perspective, it is at standstill in time and covers no distance. If time does not move for the photon, it must be outside time and it must be beyond the spacetime framework. If it was within the spacetime framework, time for the photon must change. What does this really mean? Anything beyond time must be in a dormant condition; it could also be called un-manifest condition. What is the “un-manifest” condition? According to Vedanta, it is in its potential form, just like a tree is in an un-manifest, potential condition within a seed. The physical tree still has not come out, but the tree is there in a potential form in the seed. So only a tree will manifest from this seed and nothing else. The photon is also in the same potential form. What potential form does the photon represent? The universe is the “potential” within the photon. Where does the photon reside in its un-manifest condition? Since the un-manifest photon is beyond the space time frame work and as we explained earlier that the Atma is always beyond time. It is only logical conclude that the un-manifest photon exists within Atma, which is unchanging, limitless, without boundaries. Since Atma is present in everyone, including in you, therefore the un-manifest photon is present within you, within your true reality of Atma. You, as an individual person, do not feel or realize this, because, like everyone else, you are ignorant of your own true nature. We saw earlier that according to the observer, the energy level or mass of the photon is zero, but according to the photon, the energy level of the photon is infinite. This photon with infinite energy is lying dormant within the Observer or Atma in an un-manifest condition. Now there is no infinite energy, there is only a potential for infinite energy. Whenever the Observer/Atma has the desire to view the universe, this un-manifest photon will come into the observer’s mind, this photon will become conscious and then it will manifest to become the universe we see around us. This manifested universe will have infinite energy. We know from studying Vedanta that Atma/Brahman is the underlying reality of you and of the universe. It is the Observer of your mind and it is beyond the space time framework. We have also analyzed that from the photon’s point of view, the photon remains in an un-manifest condition in your Atma. When this photon enters your mind, it becomes conscious and manifests itself. Photons, from their own standpoint, are in an un-manifest condition. They are in their potential state. The potential form of the photon represents the universe; it is not one photon, but a collection of all the photons in the universe. A good analogy would be that the potential form is like software code that represents all aspects of the universe. Just like the software needs a CPU to manifest itself, the potential form of the photon needs a mind to manifest itself. When the un-manifest photon meets our minds, it manifests itself and becomes a Vritti, which is like a mental wave within the mind. These mental waves or vrittis are the same as the probability waves which are explained by quantum physics, they are so similar in their functionality. We know from quantum mechanics that the probability waves collapse in the presence of the observing system. In the same way the mental waves of the photon collapse in the presence of Atma, which is the observing system in our minds. Maya Shakti then projects this collapsed wave function as the visible physical universe we see around us. Put in simple terms, the universe is a manifestation of just the photon. In its un-manifest form, the photon had a potential for infinite energy. This infinite energy is now unleashed into the entire universe. As we have seen, the photon is the only particle in the universe which travels at the speed of light. If we apply the theory of special relativity to the photon, the photon will feel it does not travel any distance, that time is at a standstill and that it has an infinite amount of energy. In the presence of the observer or from the point of view of the observer, the picture is very different, infinite energy is distributed all over the world and photons are zooming around the universe at the speed of light. The photon has an infinite amount of energy, but this finite universe can use only a finite amount of energy. You as an observer can only see a part of the universe and therefore only a finite amount of energy is required. I am guessing that the unused energy of the photon remains in an un-manifest condition. It must be clearly understood that the only energy available in the universe is the energy provided by photons. A photon in a wave form is also known as an Electromagnetic Energy Wave (EMV). 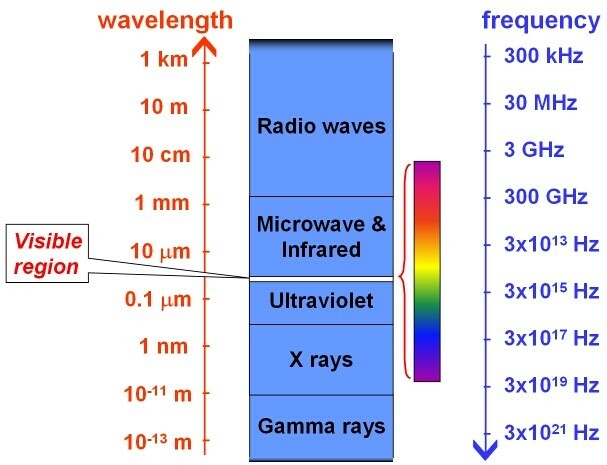 The known spectrum of light starts from Radio waves (300 Khz) to Gamma rays (3 x 1021) Hz. This spectrum of energy covers the universe. It is the source for everything. All objects are made up of energy and this energy comes with the manifestation of the photon in the presence of the observer or Atma. Only 5% of the energy is used to create the visible galaxies. We must note that 73% of the visible universe is made of hydrogen, 23% Helium and 2% is made of the remaining elements. The cosmologist still has no clue what this dark energy/matter is. They have not seen it nor identified it. It’s just an assumption to explain how the energy needed to fuel the expansion of the universe is “created”. Dark energy, Dark matter and the Visible Matter, all have the roots in the infinite energy source of the photons in the un-manifested Atma. Motion is part of our daily life. We see motion or movement everywhere. What causes this motion? How does this motion happen? You will be surprised, it is completely opposite to our conventional understanding. If there are two cars next to each other and travelling in the same direction at 60 mph, they will not experience any motion with respect to each other. They will feel they are stationery. They will feel motion if they pass a stationery person standing on the roadside. If one driver is driving at 60 mph and another person at 55 mph. They will only experience a speed of 5 mph. To explain this, physics teaches us that there are two frames of references. One frame of reference is the observer and other frame of reference is the object. If both the reference frames move at the same speed, there will be no relative motion, if they are not moving at the same speed, motion will be experienced. Motion has a knack of playing tricks with us. There are two stationery trains in a platform. You are sitting in one of them. The other train starts moving, why do we feel that we are moving, and the other train is stationery. The observer frame is stationery and the object frame is moving, but we feel that the object frame is stationery and the observer frame is moving with respect with the object frame. We look through the other side window and then realize we are stationery and the other train is moving. If there were no windows on the other side, we would really think we are moving. If there is no other frame of reference except the other train, we would really think we are moving. The conclusion is that if there are only two frames of references, then both the frame of references thinks they are moving with respect with the other reference frame. Apply this logic to our daily life. We are walking towards some trees. Are we really walking towards the trees or we are stationery and the tree are coming towards us? The idea we are stationery and trees are coming moving towards us is a possibility based on the frame of references we discussed for the trains at the platform. But can this be true? Yes, it is true, and it is the only truth. It is difficult to digest this, how can the trees move, they seem so stationery. The teachings of Vedanta can help us in this regard. We have seen in the other articles at our website, that the Observer, which is Awareness is within each one of us. This Observer is outside the spacetime fabric and is always t = 0. This Observer is not the body or mind and is always stationery and never moves. It cannot move because it is outside the spacetime fabric. If the Observer frame is always fixed, it is only logical that the trees are moving closer to us to give a sense of motion. But how can the trees and other such fixed objects in the universe move? As we have discussed in our article ‘Life is Living Wave’ that there is a fully functioning subtle universe made up of mental waves which is operating in the mind. These subtle mental waves are then projected out there as the physical world. Based on this, there are subtle waveforms of the tree in our mind. In some way (which is discussed later), the subtle waveform of the tree moves closer to the fixed Observer in the mind. When this happens, the projected physical tree will now be closer to the Observer. Since the physical tree has moved to be closer to the fixed observer, there is a sense of motion or movement of the tree. We do not feel this, we feel the tree is fixed and we have moved closer to the tree. This is exactly the same way you feel your fixed train is moving as compared to the other train in the platform. This is the grand deception of motion, played by Maya shakti. The Observer frame is always stationery and the movement of the object frame gives the impression of motion for the Observer frame. So, how does the object frame really move? What is the cause for the object frame to move? To understand this, we need to discuss the Einstein theory of special reactivity. If you understand the Einstein theory of special relativity, you will see that there is a connection between motion and time. We just saw if one driver is driving at 60 mph and other person at 55 mph, they will experience a relative speed of 5 mph. We don’t have this experience with reference to the speed of light. Light is travelling at 186,000 miles per sec and suppose you are traveling in a car at 60% of the speed of light. Sitting in the car, you would logically expect the light to travel at only 40% of its usual speed, but if you take measurements you will find to your amazement that light is still travelling at 186k miles per sec. The same applies if you increase the speed of the car to 80% of speed of light or slow down to 30% of the speed of light. The speed of light is fixed at 186,000 miles per hour irrespective of the frame of reference. What has happened is that time has slowed down so that light still covers 186K miles in one second. Since time has slowed down, the space of 186K miles will be smaller as compared to earlier. The space is still 186k, but the measuring ruler has shrunk, so the space measurement is still 186K. Amazing but true. If you increase the speed of the car to 80% of speed of light, time will slow down further, and space will further contract. If you now slow down to 30% of the speed of light, space will now expand. All this is done to ensure that the speed of light is a constant at 186,000 miles per sec. This expansion and contraction of spacetime also happens even when walking or running. However, the speed at which you walk, or run is so slow when compared to the speed of light that you are unable to notice, but the changes to the space time framework are always occurring. This mean motion and time are interconnected. As speed of motion goes up, time slows down. If you reach the speed of light, time will not move, it will be fixed. Suppose Person A is sitting in a chair, Person B is walking, Person C is running, Person D is cycling, and Person E is driving a car; all of them are moving at different speeds; this would mean that each of them will have their own separate spacetime framework. From the above, it would seem the time clock of each moving person is different. This means that the atoms are vibrating differently for each person. If atoms are vibrating differently, the object makeup will be different. In other words, each person is not only having a separate spacetime framework, but all the objects in that spacetime framework are different. Vedanta teaches us that subtle mental waves comes first, and the subtle waveforms is the cause for the gross world around us. The subtle waveform projects the physical world out there. If you apply this reasoning, time must come first, and the time waveform is the cause for motion. So, the correct way to interpret the connection between motion and time is that when time slows down, then motion is created. When time slows down, it is only logical to expect the objects would be closer to the Observer. The physics equation s = v*t will support this. When time t is a smaller value, the distance s will be smaller, meaning it is closer to the Observer. There is motion of the object by slowing of time. Before the slowdown of time, the objects were at a certain location and by slowing down of time, the objects have moved closer to the fixed Observer. The objects have moved, meaning there is motion. However, we feel the opposite, the objects are fixed, and the Observer has moved. This is exactly the way we feel when the other train moves in the platform. We are fixed, and the other train is moving, but we feel the other train is fixed and we are moving. Next time you are walking or running, just imagine you are fixed at your location, but the objects around you are moving closer to you. True and amazing. Just a quick word about acceleration. The same logic also applies to acceleration. Acceleration is a type of motion, so here also time controls the motion. In the earlier discussion, the time slowed down by a fixed amount and this resulted in motion at a fixed speed. But in acceleration, time slows down by squaring itself, this results in motion being accelerated. So time is king, it controls both velocity and acceleration. Millions and millions (maybe countless) of objects make up the universe. So how are these objects put together to create the universe we see around us. From Location A, you can see 4 trees at different distances. Location B is 500 feet back, so the same 4 trees will be 500 further away. There is nothing complex about this, we see this type of scene every day. We see objects at different distances from us daily. We are so used to seeing space in terms of distance. Doing this hides all the underlying mysteries of this universe. If the distance between the tree and you is zero, light will take zero seconds to reach us. This would mean you would see the most current version of the tree. I like to call this the ‘now’ tree. The tree we see at 100 feet is a 0.1 µs younger version of the tree as compared to the now version. This is because light takes 0.1 µs to reach us, so what we see is not the ‘now’ version but a 0.1 µs younger version of the tree. Tree 3 at 500 feet is a 0.5 µs younger version of the tree. Extrapolating this, the moon we see is a 3 sec younger version as compared to the ‘now’ moon. It takes light 3 sec to reach us from the moon. The sun in the sky is an 8 min younger sun as compared to the ‘now’ sun. If a distant planet is 1 million light years away, then that planet will be 1 million years younger than what it is ‘now’. None of the objects we see in the physical universe out there is a ‘now’ object, they are all ‘memory’ or dated objects. In terms of placement, the closer the object is to you, the less dated it is and the objects which are further away are much more dated. Einstein in his theory of relativity mentioned the presence of a spacetime fabric. Different objects are placed on the fabric depending upon how much time it takes light to reach you from these objects. If light takes less time, these objects will be closer to you on the spacetime fabric and if light takes a longer time, those objects will be further away on the spacetime fabric. In the tree example, the light from tree 1 takes 0.1 µs, so it is placed much closer to you on the spacetime fabric as compared to tree 4, which takes 1.0 µs. Light takes 8 mins from the sun, so it is placed 8 min away on the spacetime fabric. In the same way all the different objects are placed appropriately on the spacetime fabric. So, where does the spacetime fabric start and end. The only logical starting place is You. We are talking about light reaching you from different objects, so you or your location is the critical starting point. This is the t = 0 for the spacetime fabric. Let us look at this in a different way. In the current example, location B is 500 feet away from Location A. If you were standing at location B, light will 0.6 µs to reach you from tree 1. If you move to location A, which is 500 feet closer, light will take 0.10 µs to reach you. If you are standing at tree 1, light will take zero seconds to reach you. This also shows that the spacetime fabric must start with your location. The end of the spacetime fabric will be the longest distance you can see. If you are indoors, the spacetime fabric will end at the walls of your house because you cannot see anything beyond the walls. Outdoors it will depend upon what you are seeing. If you are seeing the stars, the spacetime fabric will cover a long distance into space. So, the spacetime fabric keeps changing depending up on the scene you are seeing. There are two people, person 1 is standing at location A and person 2 at location B. They are looking at the same trees but from different distances. They are looking at the same trees, but are they seeing the same version of the tree? The answer is no, they are not seeing the same version of the tree. Person 1 is seeing the 0.1 µs younger version of tree 1, while person 2 is seeing the 0.6 µs younger version of tree 1. The age difference between the two versions is 0.5 µs. This difference is very small, but it must be understood that the two versions of tree 1 are not the same. The same applies to tree 2, 3 and 4 and in fact to every object in the universe. It seems Person 1 at location A has a spacetime fabric with his own version of objects. Person 2 at location B even though looking at the same objects has a completely different spacetime fabric with different versions of objects. We have seen earlier that the start point for spacetime fabric is You. So, person 1 has his own spacetime fabric with his own version of objects. Person 2 also has a different spacetime fabric with a different version of objects. It is breathtaking to conclude that every living being in this universe creates their own spacetime fabric and place different versions of objects on this spacetime fabric. It must be understood that spacetime fabric comes from the mind and is a creation of the mind. Suppose Person 1, moves 500 feet away from location A to location B looking at the same trees. What happens? At location A, this person was seeing the 0.10 µs version of the tree 1, but from location B, this person sees the 0.60 µs version of the same tree. It is same tree, but different version of the tree. What happened? It is a physical tree out there, how did it change its version? Who changed the tree version? Did someone uproot the old version and replace it with the new version? This not only applies to tree 1, but all the objects which are being viewed along with the tree. If person 1 moves 10 feet back, this person will now a see a different version of all the objects. This means any movement forward or backwards by this person or any person will always result in a different version of all the objects being viewed. The object version is continuously undergoing change. How to explain this continuous change? Can Science explain this? I do not think science has any explanation. So, what is solution? Vedanta has a clear-cut and correct explanation. Vedanta has always maintained that there is no physical world out there, it is only a projection of the mind. The mind projects the physical world. It is not like a projector and a screen. The mind itself becomes the physical world. Your mind is the physical world. In the articles at our website ‘Understanding the Mind series’ and ‘Life is Really a Wave’, we have given a detailed explanation about how the mind functions, how the mind creates and projects the physical world. For our current discussion understanding the role of time is important. Time must be subtle – you cannot see it, touch it or feel it. Vedanta teaches us anything subtle must be part of the mind. Everything which is present in the mind is made up of mental waves or Vrittis. So, Time is present in the mind as a mental wave. This wave has the power to create Time. It is quite difficult for us to understand or visualize the composition of this waveform, but one thing is certain that Time is subtle and therefore it is a waveform and is present in everyone’s mind. Vedanta also teaches us that all the objects in the world must have a subtle form and this form is present in the mind as mental waves or Vrittis. The time waveform combines with each object to create a combined time object waveform. The time factor is now added to the object. It is like a mathematical waveform with time as a variable. If you think about it, this superimposed waveform will now provide a history or timeline of the object. Since Time has been superimposed on the object waveform, the new waveform will have the ‘potential’ to show the object in all it stages of growth from its birth to right now. The object with the historical time line is present in the Vritti in its ‘potential’ form. Let us how this work for tree 1 when person 1 is viewing from location 1. There is tree vritti or waveform in our mind and this waveform superimposes with the time waveform to give a combined tree 1/time wave form. This combined waveform has to potential to take up any version of tree 1 from its birth to now. Since the tree is 100 feet away, the combined time/tree 1 waveform takes up the 0.1 µs version of the tree. When this 0.1 µs version tree waveform meets with Awareness it collapses. When this waveform collapses, the 0.1 µs version of the tree is projected out in its physical form and it is placed at 100 feet on the spacetime fabric. In the same way, all the other time/objects waveform in mind collapse in the presence of the Awareness and the correct time version of each object is placed on the spacetime fabric. Now person 1 moves to location B to see the same trees. All the trees are now further away. Here again, the time vritti combines with tree 1 wave form. This combined waveform has the potential to take up any version of tree 1 from its birth to now. Since the tree is 600 feet away, the tree takes up the 0.6 µs version of the tree. This 0.6 µs version tree waveform collapses in the presence of the Awareness. When this waveform collapses, the tree is projected out in its physical form and it is placed at 600 feet on the spacetime fabric. We have been talking about a single tree, the outdoor scene is complex with so many different objects at different distances. If you put all this in the time scale, the processing of the scene is not easy. Depending how far the object is, the correct time version of the object must be selected. This must be done for every object in the scene. If we move forward or back, or if we see another scene, the full process must be repeated. It is not easy to fathom how all this processing is taking place in the mind. It seems very difficult. Is there an easier way to understand this complex process? Yes, I believe there is a map of the entire universe pre-installed in the cosmic mind. Depending upon the persons location, the relevant sub-portion of this map will show up in the individual mind. It is exactly like Google Maps. The entire map is available, but depending upon our location, only that local map will show up. If we move around, the map will adjust to the new location. The pre-installed universe map works exactly in the same way. The objects in this universe map will be pre-treated for the correct time version depending upon the distance of these objects from you. This universe map is dynamic and updated instantaneously. For example, you cut a branch of the tree, the universe map will update itself immediately. The next person who sees the tree, will see the missing branch. To understand the complexity of the universe, it maybe a good idea to start looking at space in terms of time and not distance. This will highlight that the version of the objects keeps changing with our movement. It will also give a feeling that we are the starting point of the spacetime fabric and we are projecting our own world, which is different from others. Oh! What a feeling.